The Department of Social Welfare and Development (DSWD) recognized the exemplary performances of local government units (LGUs) during its annual Culminating Activity conducted last August 27, 2013 in Legazpi City. Kapit-Bisig Laban sa Kahirapan-Comprehensive and Integrated Delivery of Social Services (Kalahi-CIDSS), one of the poverty alleviation projects of the national government implemented through the DSWD, is currently being implemented in 20 municipalities throughout the region. which started last April 2012. More than 30 awards were given out to municipalities and personalities who contributed to the project’s success on its first lap of implementation. The highlight of the event was the awarding of the best group of community volunteers, given to Barangay Pagao in Bombon, Camarines Sur. The prize was given based on compliance with standards, efficient implementation of the sub-project, effective fiduciary management, facilitated improvement in the local policy environment, and management of the formation of a strong association for sustainability. Bombon was also recognized as best municipality in disbursing funds. They were able to facilitate release of grant funds, deliver the required LCC as planne,d and complete utilization of project funds within the given timeline. The municipality managed 94% funds utilization as of April 2013. Bombon was also awarded as the best municipality in gender mainstreaming. It was able to successfully mainstream women in sub-project implementation, strike a balance at community volunteers and committee leadership composition and capacity building. The municipality also attained the highest percentage of women in paid labor in the sub-project implementation. The barangay sub-project which was considered the best in terms of compliance with standards, technical specifications, budget, technology, and strategic benefits to the communities was given to Brgy. Tapol, Baao, Camarines Sur. Palanas, Masbate was awarded as the municipality with the highest percentage of local counterpart contribution based on the Local Counterpart Contribution (LCC) Delivery Plan to support the sub-project implementation within the Cycle 1 Timeline. The LGU delivered 96 % of LCC for Capacity Building and Implementation Support and 95% LCC for SPI as of April 2013. Libmanan, Camarines Sur won the award for the municipality able to mobilize the Provincial Local Government Unit for LCC support and for Capacity Building and Implementation by providing a team of 10 Provincial Community Facilitators. It also got an award as the Best Municipal Coordinating Team (MCT), wherein the municipality provided the requisite MCT complement following the standard ratio and qualification standards. A total of 28 MCT staff members were provided by the LGU. The project also ensured complete logistics to ensure functionality of the team based on the terms of reference and plans formulated by the LGU and meet the targets set by the project management. The municipality of Irosin, Sorsogon has successfully mobilized technical, logistical and manpower and moral support from the Municipal Inter-Agency Committee and their staff members in the planning of activities, monitoring, performance assessment and resolution of project issues and was recognized in this aspect. It also received the award for Best Disaster Risk Reduction (DRR) Mainstreaming because the municipality successfully integrated DRR in the planning and implementation of poverty alleviation interventions, integrated the DRR baseline data of the barangays with the community level planning in Kalahi-CIDSS, and shared in addressing the bigger issue of Climate Change Adaptation and DRR. Kalahi-CIDSS is a community-driven development (CDD) project in the Philippines which strongly advocates the involvement of local communities in the design and implementation of development projects to address the issue of poverty in the country. CDD is a globally recognized strategy for achieving service delivery, poverty reduction, and good governance outcomes. It aims to improve local governance by employing the participation of the people in the communities in the development process. Camarines Sur press was engaged in the one-day monitoring visit last October 1, 2013 to DSWD’s community projects in towns where Kapit-Bisig Laban sa Kahirapan-Comprehensive and Integrated Delivery of Social Services (Kalahi-CIDSS) is currently being implemented. There were ten media from broadcast, print and TV who joined the team of DSWD during the trip to Bombon and Gainza, Camarines Sur, heading first to two barangays in the latter with completed Kalahi-CIDSS subprojects which are water system level II and day care center in Pagao and San Francisco, respectively. They then proceeded to Gainza and visited the community projects namely health center, drainage canals, production center for handicraft and training center for mothers and out-of-school youth (OSY). They came face-to-face with all the key players of the project, namely, local residents, Kalahi-CIDSS volunteers and local government officials (community and municipal level) who submitted themselves for an interview with the media discussing the status of implementation in terms of how the people managed their funds and other resources. During the courtesy call with Mayor William A. Abilay of Gainza, he said that the people decided what project would solve their urgent need in the community which was addressed by Kalahi-CIDSS. “Since our town is considered to be a low-lying area, most of the communities agreed to propose drainage canals for funding under Kalahi-CIDSS. The municipality has provided Php986,988.38 as its counterpart to the project,” he said. On the other hand, Jesus Gipanao, a volunteer in Pagao, Bombon, explained to the media how the whole process worked for them in their village. “Kinonsulta ang mga tao sa paagi ning barangay assembly kung sain nagkasararo kami na patubig talaga ang kaipuhan mi [the people were consulted through community assembly and we have agreed that what we really need is water system],”he said. During the closing activity in Brgy. Cagbunga, the last destination, the members of the press conveyed their appreciation to the project. Jane Betito of Radyo ng Bayan noticed the transformation in governance. From top-to-bottom approach, she said that it has now employed the participation of the people which entails accountability over their projects and has maximized the use of government funds. “Sa likod kang mga kontrobersiya na nadadangog sa mga bareta, ugwa pa kitang nahihiling na positibo pa. Sa paagi kaini, nailing mi man na may ahensya pa ning gobyerno na dapat pagtawanan pa ning pondo para maipadagos ang pagtabang [despite of the controversies over the news, there are still positive ones. We have witnessed that there are deserving government agencies to where we can entrust our money],” Pros Atule of DWRN said. The field visit gave the media the opportunity to monitor Kalahi-CIDSS projects and also gave them the chance to be exposed to the real situation of poor communities. “Dakulang bagay ini ta bako lang sa istorya kundi mismong nailing mi ang kamugtakan kang mga project [This is crucial because it’s no longer a hearsay but we have witnessed the project,” Arnold Salcedo of DWRN said. Other members of the delegation were composed of Eric Avila of DZGE, Danilo Abad of PIA Camarines Sur, Mar Barroga of RPN and Mylce Mella of ABS-CBN Naga. It is one of the core social protection programs of DSWD along with Pantawid Pamilyang Pilipino Program (4Ps) and Sustainable Livelihood Program (SLP). Kalahi-CIDSS was first implemented in Camarines Sur in 2005 and to date, has provided over 200 million grants to 483 poor communities in the province. Living near the riverside of Barangay Panan-awan, Cawayan in the island Province of Masbate resides the Family of Macanas. This family is among the beneficiaries of Pantawid Pamilyang Pilipino Program who proves that poverty is not a hindrance to attain success. For them having wealth is not how much money you put in a bank, it is the value of having respect to others, helping their neighbors in times of need, teaching your children the value of education and health, and putting God as the center of your life. Mr. and Mrs. Edgar Macanas, has four kids who were Edwin, 17, Erwin, 15, Emerson, 12, and Erlene Mae, 10. Despite providing meals to their children is a struggle but their children are their inspiration to continue earn for a living. “Lahat ng trabaho ay pinapasukan ko, sa konstraksyon, sa pagsasaka, at pag-aalaga ng mga hayop, para maabot ang pangarap ng aking mga anak,” said Edgar or “Tatay Edgar as he fondly called off by his children. In addition to their earnings, Nanay Rowena, 37, plants crops, beans and vegetables in their backyard. She is also working as a volunteer Day Care Worker in her community. The couple put high regard on praying as their daily activity. Nanay Rowena said she made sure that they pray before meals and before going to bed. All of the members of the family also allot time to read the bible and reflect. “Ang tanging sekreto lang namin upang maging maganda ang samahan ng aming pamilya ay ituro sa aming mga anak ang halaga ng may takot sa Diyos, pagmamahal sa isa’t isa at tumulong sa kapwa,” Rowena said. She is also proud that her eldest son is now in college preparing to become a priest someday. Two of her sons, Erwin who is in High, and Emerson, in elementary, are also active in the church. “Si Erwin ay lecturer sa simbahan at sakristan naman si Emerson. Masaya ako dahil sila mismo ay kusang tumutulong sa aming simbahan. Proud ako sa aking mga anak,” she added. The importance of education is one of the wealth that Mr. and Mrs. Macanas wanted to instill to their children. “High school lang po ang natapos ko, kaya gusto ko na makapagtapos sila ng kanilang pag-aaral, yun lamang po ang tanging maipapamana naming yaman sa kanila,” Tatay Edgar shared. At night, Nanay Rowena made sure to check her children’s assignment. In monitoring the performance of their kids in school, the couple visits the school weekly, and talk to their advisers. “Kaya malaki po ang pasasalamat namin sa Programa dahil sa limang taon namin na pagiging benepisyaryo ay nakatulong ito ng lubos sa mga gastusin sa eskwelahan ng aming mga anak,” Rowena said. Also, Erwin and Emerson worked hard to be consistent honor students as a return to their parents struggle in sending them to school. Erwin belongs to the top in class. He is also fond of joining school competitions like slogan making and essay writing contest while Emerson is more inclined into sports. Erlene Mae, the youngest, is also inclined in joining badminton competition and other extra-curricular activities in school. “Masaya po kami dahil sinusuportahan po kami ng aming mga magulang, kaya naman po, bukod sa gusto naming suklian ang kanilang pagmamahal ay tinutulungan din namin ang aming kapwa estudyante na mag-aral ng mabuti at maging aktibo sa activities sa eskwelahan,” Erwin said. Having fresh vegetables in their backyard, Nanay Rowena often served vegetables in their meals. “Gustong-gusto ng mga anak ko ang lahat ng klase ng gulay. Minsan sila na mismo ang namimitas sa bakuran namin,” Rowena shared. Children are also given vitamins as their protection to any kinds of diseases. “Si Erwin may asthma kaya iniingatan rin namin ang kalusugan nila,” she added. Aside from valuing health and education, the family is active in the community. They offer what they have for their neighbors. According to Barangay Captain Antonio Rosell, Rowena is very prompt in giving help to her co-pantawid beneficiaries. She helps even beyond being a parent leader. “Kahit yung mga senior citizen dito sa amin ay nag-patulong sa pag-process ng kanilang I.D kay Rowena. Pati sa mga problema sa pamilya ng kapwa niya benepisyaryo ay handing tumulong ang mag-asawa hangat kaya nila,” Barangay Captain Antonio said. It was also Rowena who lobbied to the local government to provide Christmas bonus to Day Care Workers. The couple is also a volunteer of Kapit-Bisig Laban sa Kahirapan-Comprehensive and Integrated Delivery of Social Services—another anti-poverty reduction program of the local government that provides infrastructure and facilities to poor communities. More than that, the children were also active community activities. “Handa po kaming tumulong at maging modelo sa kapwa namin na mga bata na tumulong sa aming barangay. Maglinis ng bakuran, at sumali sa mga clean-up drive,” Erwin said. In order to help their parents in their finances, the children learn to save money from their “baon”. Each of them has a piggy bank where they can put their extra money. “Nagiipon po kami pambili ng aming gamit sa pasukan. Nakabili na rin ng aalagaang hayop si Kuya Emerson para may pang-tuition po siya sa susunod na pasukan,” Rowena proudly stated. Sometimes the children are willing to give what they saved when their neighbors needed financial help. “Itinuro po sa amin iyon ng aming mga magulang,” Rowena added. The children were also taught by their parents to recycle and care for the environment. “Yung mga pwedeng magamit namin na notebook ay nirerecycle namin para sa susunod na pasukan,” she shared. They also help each other in doing household choirs. “Tulong-tulong po kami nila Kuya sa gawaing bahay at ako naman po ay nag-eenjoy na magluto at magsaing ng kanin,” Rowena added. It is also not a big thing to Tatay Edwin to do the laundry and cook food for his children when Rowena was busy in doing community works. “Naiinitindihan ko ang aking asawa. Kesa sa mag-away kami, tinutulungan ko siya. Mas masarap sa aking pakiramdam na nakakatulong ka,” Edgar said. Even if they have no luxurious things in life, but Macanas family regarded every member as a precious gift. Their wealth are the things that money cannot buy. They instill to their children good values and character that they can able to bring with them when they grew up. The engineering department’s graduating class from the Catanduanes State University (CSU) went to one town in Catanduanes last September 19, 2013 where poverty reduction projects of DSWD are being implemented. Together with one faculty member, 59 students roved the municipality of Viga with an on-going implementation of the Kapit-Bisig Laban sa Kahirapan-Comprehensive and Integrated Delivery of Social Services (Kalahi-CIDSS). The staff members of the local government unit (LGU) of Viga and DSWD provided assistance during the field visit. Engr. Bienvinido Berjuega, CSU Extension Services Coordinator, said that they are not only looking into the technical aspects of the Project, of which part of its scope includes the provision of small infrastructures and common service facilities to villages in need of these, but also how funds are being managed and disbursed under this. The one-day tour kick-started with a 15-minute orientation at the municipal hall, given by Russel Malejana, Kalahi-CIDSS Area Coordinator of Viga. They then proceeded to Magsaysay, Tinago, Del Pilar, and Ananong, all of which are barangays within the municipality that have Kalahi-CIDSS subprojects, which were a day care center, a pump-driven water system Level II, a 60-meter sea wall, and a water system Level II, respectively. The students had a positive response to their learning visit, particularly on how the government addresses needs of the marginalized sector and Engr. Berjuega affirmed this. “We witnessed a process where the community itself is at the forefront of implementing its own interventions on the felt problems of the residents through their chosen solution/project…We also confirmed how wisely the communities manage their funds… Far and opposite from the national issue on the utilization of PDAF,” he said, referring to the recent controversies surrounding the Priority Development Assistance Fund (PDAF), more popularly known as PDAF. Community residents consensually decide on what type of poverty-reduction projects they prioritize for funding based from the collective analysis of their needs. Community proposals can vary from public goods/access projects, enterprise or livelihood projects, or human development projects. In spite of its natural treasures, a rural community in Camarines Sur is still caught in the grip of poverty. Mainly comprised of nipa-makers, farmers, and fishermen, the high spirits of these industrious people have slowly depleted because of their long-term struggle against scarcity. Fifteen kilometers away from its town proper, the coastal village of Pagao remains afflicted with poverty, being the only community in Bombon that is geographically distant from the other villages. The easiest way to reach it is by taking a “habal-habal” (passenger motorcycle). Even then, the motorcycle will need to pass through another town before reaching Pagao. However, the distance was only one of the problems encountered by the residents of Pagao. The community has long struggled with having access to safe drinking water. Amy Britanico, one of the residents, described their experiences. The villagers needed to go to the neighboring town of Calabanga to buy potable water, which costs Php30-35 per container. Aside from purchasing water, they also had to spend for the round-trip transportation expenses: Php10 per container and an additional cost of Php15 for the fare of the owner. Those who cannot afford the additional expenses had to take a two-kilometer bike ride, and there are even those who are forced to walk. The latter group’s journey becomes more difficult on the way back, as they needed to carry back the full containers to their homes. It was not uncommon for children below five years old get sick because of unsafe drinking water. As a result, households spend even more money for medication. The numerous expenses due to their lack of access to clean drinking water led to them spending a large portion of their income for this, not to mention their time. In 2012, the Kapit-Bisig Laban sa Kahirapan-Comprehensive and Integarted Delivery of Social Services (Kalahi-CIDSS) Project of DSWD initiated the progress they have long sought for. With the grant of 1,023,926.00 from the Kalahi-CIDSS donor, Millennium Challenge Corporation (MCC), Pagao finally had something to capitalize on. With their determination to solve the root cause of poverty, the residents of Pagao voluntarily involved themselves in the activities and processes introduced by Kalahi-CIDSS. Their reason for their involvement was simple; they needed the help they could get from the Project. “Harayo talaga ang tigakuhaan mi ning inumong tubig [The source of water is really far]” Jose Camalla, a Kalahi-CIDSS community volunteer, simply said. Jose was one of the residents who became inspired to volunteer in Kalahi-CIDSS because he wanted to seize the rare opportunity offered by the national government to address their needs. Despite the bulk of work demanded from the volunteers, Jose, with the others, were motivated to reach their goal – finally having access to potable water. The nearest water source is in San Bernardino, Calabanga. CAWADI was more than willing to extend their services to Pagao because they can also reach another 38 households in Carigsa, Magarao. CAWADI also helped Pagao by providing technical assistance and capacity building to the Kalahi-CIDSS volunteers. They assisted in the fabrication of pipes and calibration of water meter during its construction. They also trained women laborers in pipe laying. To support the sustainability of the tap stands, two plumbers and one meter reader were chosen from the residents to attend the on-the-job training in CAWADI for free. Twelve water tap stands are now operational in Pagao, catering to 102 households. The people of Pagao strived hard to make their dream come true. But the community has another great hurdle to leap: the stewardship and ownership of their water system subproject. The Pagao Waterworks and Sanitation Association (PAWASA) was formed to operate and maintain the water tap stands. Jose and Amy, both volunteers, are members of the operations and maintenance group. Both Amy and Jose pledged to implement an organized system to maintain the community project. They established rules and regulations for the community-consumers to follow to ensure that their water system will be well taken care of. “Kung may tres ka, may tubig ka [If you have three pesos, you have water],” Jose said. The community also designated one collector for each tap stand, which serves ten households. For every container with a tariff of Php3.00, 50 centavos is paid to the tap stand collector. PAWASA will be responsible for the payment to CAWADI, which will be taken from the collection of the tap stand collectors; savings left will be for other operation and maintenance expenses. Financial reports will be posted monthly in the barangay and an accountability reporting will be done biannually for transparency. Though CAWADI has provided Pagao a 24/7 water supply, the residents agreed that fetching of drinking water should be done twice daily: 5-7 in the morning and 4-6 in the afternoon. “Dakul naukudan mi sa mga trainings na inagihan mi sa Kalahi-CIDSS lalo na sa pagpatrabaho ki proyekto. Magagamit mi ini sa pagpadalagan kaining water system para mantinido ang operasyon kang samuyang proyekto [We learned a lot from the trainings in Kalahi-CIDSS, especially in running a project. We will be able to use the knowledge for the operations of our community project],” Jose said. Pantawid Pamilya Beneficiaries in the Provinces of Masbate, Catanduanes and Sorsogon wins in the Bicol Regional Search for Huwarang Pantawid Pamilya 2013 conducted by the Department of Social Welfare and Development. In a simple awarding ceremony held last September 9, 2013 in Buraguis, Legazpi City, Mr. and Mrs. Edward Macanas of Cawayan, Masbate was awarded as the Regional Huwarang Pantawid Pamilya 2013. The family of Mr. and Mrs. Jerry Ogalesco Sr. of Viga, Catanduanes wins the second place while Mr. and Mrs. Emanuel Hermo win the third place. Cash prizes and a plaque of recognition were given to these families. The aim of the activity is to recognize the families, who are able to follow the conditions of the Program, and recognizes and adopts filipino values and strong family ties. According to Assistant Regional Director Cora B. Miña, she is proud of the beneficiaries who are able to improve their lives despite hardships. She hopes that they (winners) will continue to inspire and serve as a model family to every beneficiary. Said Huwaran Pantawid Pamilya winners have established a year of good standing in the community with no derogatory records. Also, these families earn their living not derived from gambling, prostitution, child labor, extortion, and similar illegal resources. “Nagpapasalamat po kami sa programa dahil patuloy po kaming umaangat sa aming kalagayan. At ako po bilang isang estudyante ay patuloy pong mag-aaral ng mabuti para maabot ko ang aking pangarap at maging ehemplo sa aking mag-aaral,” said Erwin Macanas. Posted in newsComments Off on Pantawid Pamilya Beneficiaries in Masbate, Catanduanes and Sorsogon Win in the Regional Search for Huwarang Pantawid Pamilya of DSWD. In order to promote and provide better appreciation to the data utilization of the National Household Targeting System for Poverty Reduction (NHTS-PR) or the Listahanan, the Department of Social Welfare and Development Field Office 5 launched its first Regional Profile of Poor Households last August 15, 20, 22, 2013 to the provinces of Masbate, Albay and Camarines Norte, respectively. The profile was the output of the 2009 enumeration in which 461,242 households in Bicol region were identified as poor. It highlights statistical data about the actual scenarios of the poor households in the region. This will serve as basis of different agencies and organizations in formulating programs and projects intended to the vulnerable and disadvantaged sector of the community. The activity was highlighted by unveiling of the Regional Profile Booklet Replica by Regional Director Arnel B.Garcia, Asst.Regional Dir.Corazon B.Miña together with the Local Chief Executives and the distribution of the booklets to the respective LGU representatives. Meanwhile, Regional Focal Person of Listahanan, Mr. Don B. Abejuro Jr. announced that the 2nd nationwide assessment will be conducted in the last quarter of this year. “Once again we will ask your full support for the 2nd round of assessment in finding WHO and WHERE the poor are in Bicol region.” he said. The provincial launchings formed part of the department’s Programs Orientation to Local Chief Executives which aims to strengthen information and partnership with the stakeholders. Likewise, to encourage LGU partners in the effective implementation of the social services being carried out in their respective areas. In attendance were DSWD representatives led by Regional Director Arnel B. Garcia & Asst. Regional Director for Operations Corazon B. Miña, Local Chief Executives, Provincial/City/Municipal Social Welfare and Municipal Planning & Development Officers. An open forum was done at the end of the activity where issues and concerns were undertaken. Persons with Disability (PWD’s) participates the NDPR week celebration at Sagrada Familia in Bonot, Legazpi City. 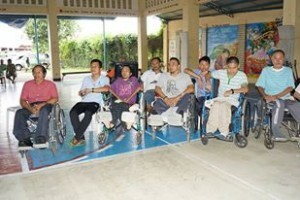 July 17-23 of every year marks the commemoration of the National Disability Prevention and Rehabilitation (NDPR) Week. This aims primarily to stimulate public awareness on the issues and problems of disability, thereby encouraging every citizen of the country to take active in the upliftment of the economic and social conditions of the Persons with Disability (PWD’s)in our society. DSWD Director Arnel Garcia said that the theme “Building on Inclusive and Non-Handicapping Environment for Persons with Disabilities” promotes the principle and concepts relevant to disability inclusive development and also extends to advocate for the mainstreaming of disability agenda in all government agencies, non-government organizations, civil society and the public in general. Spearheaded by the Regional Council on Disability Affairs(RCDA), the NDPR week celebration was kicked-off by an econometrical celebration and an opening program with 307 participants from various GO’s, NGO’s, SPED students, teachers and member agencies of the RCOA. A Legal Aid Clinic was also organized which serves as venue for the PWD’s and other members of the community to raise questions, issues and complains relative to the implementation of laws pertaining to persons with disability. Sponsored by DOLE Bicol was the conduct of Capacity Building Enhancement Seminar for Differently Able Group and Coordinators. The weeklong celebration was culminated by the conduct of Access Audit on the facilities of the Legazpi City terminal and posting of accessibility stickers at the public utility vehicles. This was done by the members of the RCDA.